I swear, I am not planning all this math. My plan is actually to just see what comes up. And what comes up is...math. Everywhere. All the time. The current math-ish project was inspired by a message from my father. 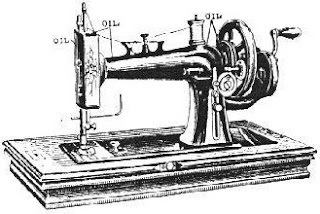 He and my mother went in on a hand-cranked sewing machine for the girl. 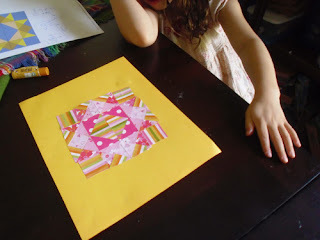 When we go out that way in a few weeks my dad says he'll give the girl a full quilting lesson from start to finish: practice with the sewing machine, pick her design, choose fabric, cut it, piece it, etc. I'm not sure if they'll have enough time, but one thing's for certain -- we'll be coming home with a cool little old-fashioned sewing machine! 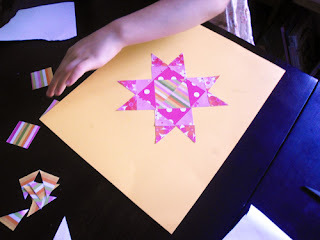 The girl heard the news and immediately started designing her quilt pattern with pattern blocks. She often sees grand projects fully developed in her head, but doesn't realize how complicated and time consuming they are. (I get exhausted just listening to her tell me about them.) So I decided to go on-line to find a 'simple' quilt block pattern that we could make using paper. 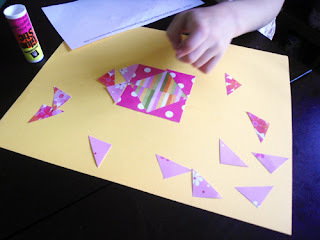 I wanted to give her a clear sense of the kind of effort and time it takes to measure, cut, and piece together a seemingly simple multi-piece pattern. Just for the record, it takes a looong time. suggested we start with the center and built out from there. "Look Mama! Here's a rectangle made up of triangles!" that it made an X of sorts. simply the end of the first chapter. I wonder what comes next? The girl was low energy, snuffy, and generally under the weather. She wanted to play some games, but after the first one made a pointed request to "play some games where no one wins." She went to the game shelf and pulled down this...not sure what it's called, but it's been on the shelf for years without much use -- until today. 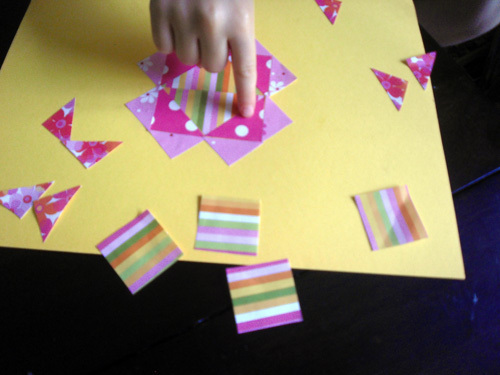 At first she wants, uncharacteristically, to do the pre-printed puzzles that came with it, but after a time we moved to more free form designs. "What's this?" I ask, holding up a white piece. "A parallelogram," she promptly replies, surprising me. Yes, and also a rhombus. There's a larger blue rhombus too. And the red piece is called...oh, I always forget. Oh yeah, a trapezoid. It's a triangle with its top cut off. And, not an octagon, a hexagon, with six sides. It's yellow. We play around a little. Did you notice that a blue rhombus and a green triangle can combine to make a trapezoid? 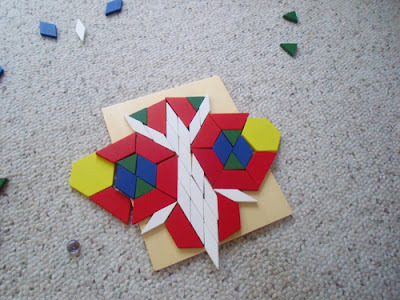 And two trapezoids can make hexagon? 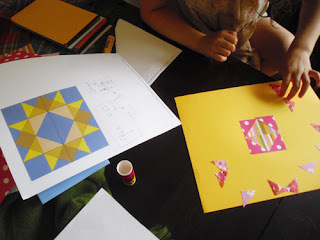 The girl discovers that she can place six trapezoids around the yellow hexagon and make a larger hexagon,and that she can take out the yellow center and fill it in with different combinations of green triangles and blue rhombuses, but is more interested in making a 'quilt design'. "Remember to match your pieces edge to edge if you want them to fit together," I say. 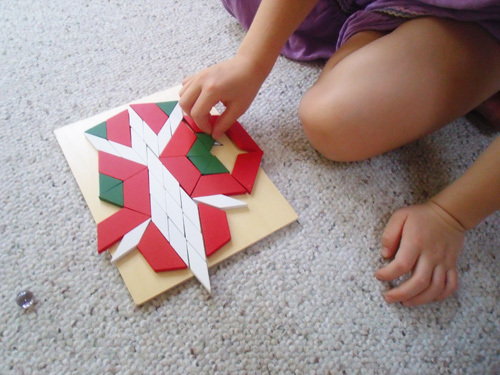 We collaborate on this white and red 'quilt block' a little, but the basic structure and design is hers. Somehow all our designs seem to come out balanced. "Look!" I say, "You can draw a line down the middle of this design and you'll find the same shapes in the same places on both sides!" Although that is not completely accurate. The hexagons are both about three inches from that line I mentioned, but one is 3" to the right, the other to the left. A small but important point that seems to come out most clearly when I'm showing fourth graders how to reflect their Jump Patterns. Speaking of reflection symmetry, the girl wants to do the butterfly puzzle together. "Let's take turns," she says, "you do one side and I'll do the other.' We take turns, but I get bored. I suggest quite enthusiastically, "Why don't we try to make one just like it, but bigger? Why don't we make one that is twice as big?" I ask, "How many orange squares in the first design? If we're doubling that number how many do we need?" We are both quite engaged as we work on the design. 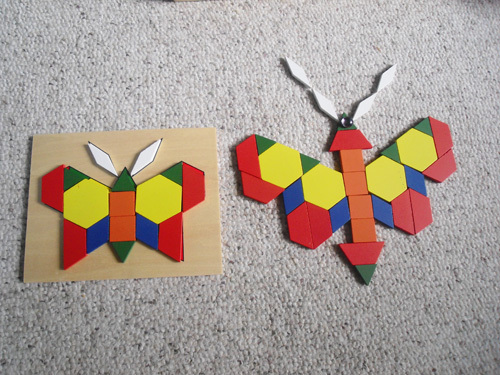 We have the 'rules' to work with -- each piece on the original butterfly has to be doubled, but it isn't always clear how to include them in the design. "We made it twice as big," she declares, "and twice as beautiful!" Busy Saturday morning. Parents not paying attention to kid. 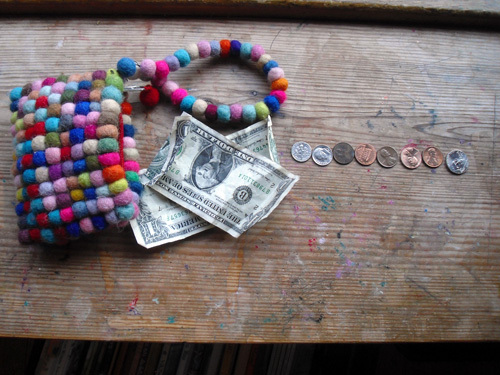 Suddenly kid says, "Look Mama, I have two dollars and thirty cents!" Mama goes over to look. By George, I think she's got it! Looks like the postcard caper is paying off! "How did you get that number?" I ask. "Well," says she, "Ten plus ten is twenty. Then there's five more makes twenty-five, and..."
So, she added it up correctly, but it's apparent the reasoning part still needs some more work. Still, I'm thrilled! I am so lucky. As I work to deepen my understanding of elementary math education, not only has my daughter just become a first grader but I also have many opportunities to observe how she comes to understand and represent math. "I want to make an Origami paper crane like V. gave me," she proclaimed. V. is a new friend, about ten years old, whom she met recently. They have a lot in common, including a passionate penchant for constructing things. 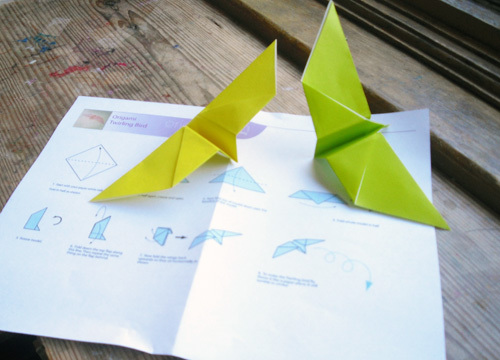 Unfortunately, paper cranes are not the easiest to start with, so I found this Origami Twirling Bird at a website I've used for one of the Math in Your Feet Family Night stations. Immediately I found myself using math words and concepts as we worked to follow the folding directions. 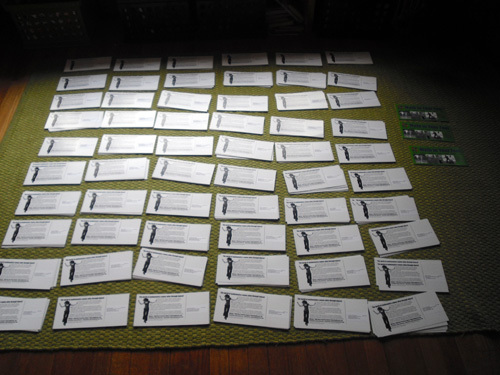 "Okay, let's read the instructions," I said. "Here it says, 'Start with your paper white side up. Fold in half, as shown.'" "Oh look!" I continued, "you fold point to point. 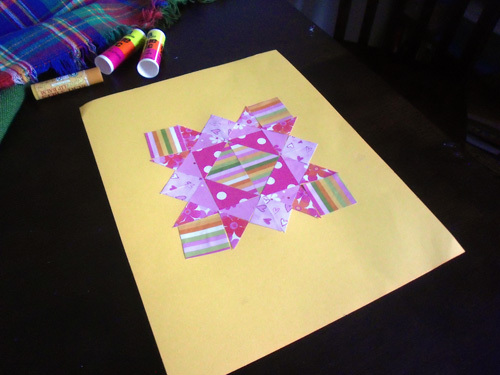 Take the bottom point and fold it up to the top point, but also make sure the edges are matching." Points and edges! Whole to half. Rotate. Fabulous. We continue along these lines when, magically, quickly, the bird is done. We fly them, and they twirl like fall leaves. Well, almost; they actually twirl nose over tail like horizontal helicopter seeds. If they could make a sound they'd be giggling. Time for lunch. Lunch is still not ready. "Hey Isobel," I say, "Come in here and fly your birds. Which way are they twirling, do you think? Nose over tail, or wing over wing?" "Wing over wing does a spinning bird spin? Ha ha! Head over heels!" And there, ladies and gentlemen, is our multi-modal, multi-disciplinary math lesson for the day: a fine motor, gross motor, kinesthetic, auditory, visual, language based and personally expressive math lesson. 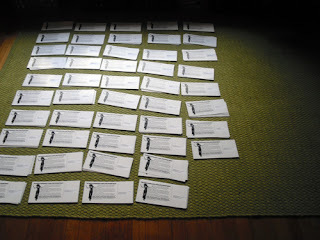 Soooo...I needed to count and stamp like a kajillion postcards. The girl was jonesin' to make some money. I had the thought there was some math to be made in the process. It was a match made in heaven if there ever was one. Mama: "How many tens make one hundred? 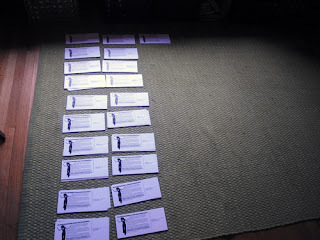 We'll count out piles of ten postcards, put ten piles of ten in each column and see how many hundreds we have." Daughter: "And ten hundreds make a thousand!" Mama: "Well, I hope I don't have to buy that many stamps." Mama: "How many do we have now?" Daughter: "Two hundred and one." Mama: "Remember, each pile is made of ten postcards..."
Daughter: "Two hundred ten!! And when we're done with this you'll give me a dollar, no, three dollars!" Mama: "Well, it depends on how long this takes, and we still have to put on the stamps." Mama: "How many more tens do we need to go from four hundred eighty to five hundred?" Daughter: "Two!" [Yelling through the house] "Papa! Papa! We're almost at five hundred!" Papa: "Wow, that's half way to a thousand." Mama: "Look at how many postcards we have left to count. 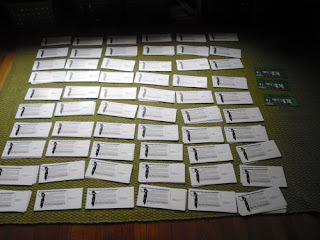 How many postcards will we have all together when we're done counting?" Daughter: "Oh, at least a thousand." ﻿Mama: "Let's count the columns of ten. How many postcards to we have?" Daughter: "One hundred, two hundred, three hundred...six hundred and three!" Mama: "Go get your slate....Okay, how many hundreds do we have?" Mama: "Okay, write that down. How many tens?" Mama: "How many single postcards do we have?" Mama: "And that's how you write out six hundred three. Hundreds, tens, and ones." Daughter: "When do I get paid?" Epilogue #1: She got a disappointing (to her) $.75 for this part of the part of the project, which took about 20 minutes. 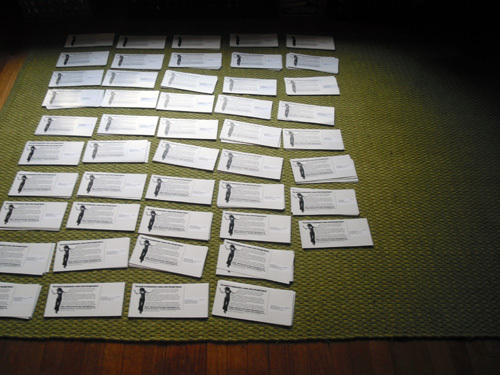 "But remember," I said, "We still have to put on all six hundred and three stamps. That will take quite a while." She was so excited about earning money she offered to fold the laundry to earn more, which led to adding up the contents of her money jar. 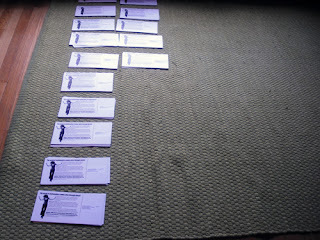 Epilogue #2: I know I said recently that I didn't think we needed to rush the math to the page just yet. It's just that this situation was so perfect for introducing how to write numerals in the hundreds. Epilogue #3 (August 24): We've stamped two thirds of the postcards and the stamped piles are made up of 200 postcards each. 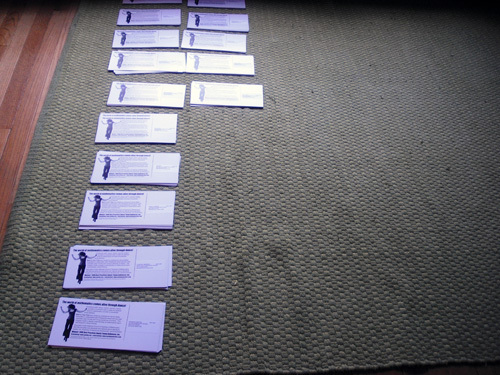 The unstamped postcards are still in piles of 100. She was trying to figure out how many we had left to stamp. I pointed out that you can count by twos -- two hundred, four hundred...etc. She listens to my semi-lame explanation and then says, "That's a great deal of learning on how to count faster." Ha! My six year old daughter has many, many questions and observations that can be filed under the catch-all category of 'spontaneous math'. In fact, most of the math thinking she does exists primarily in the verbal realm and in relation to the moment she's in. We seem to have some kind of math related conversation every day. She has been known to enthusiastically break into a chorus of counting to twenty by ones, then to 100 by tens, forward and backward. She likes chant counting by twos as well. She has two cosmo flower plants in her garden that she has nurtured from seed. They have not yet flowered (and it's mid August!) but they have been a daily source of measurement since early summer. "The cosmo is taller than me! It's up to Papa's chin now!" she cries as we turn towards autumn. She agrees to fold a basket of laundry for 50 cents. She says, "Will you give me fifty more cents if I put it away?" I say, "No, but I'll give you a dime. How much is that all together?" When it comes time for payment, I say, "How many quarters should I give you? How many pennies is a dime? How many other ways can you make ten cents using pennies and nickles?" She starts to put her hard earned 60 cents into her savings jar and then dumps it all out on the counter. "Let's see if I have enough change to make a dollar so I can exchange it for a dollar bill!" Only eight cents short. Back to my daughter...who is curious about how much things cost, and how that compares to other things we buy. It's a little embarrassing when our neighbor brings her a birthday present and she asks how much they paid for it, but she's there's something she's trying to understand, even though I'm not quite sure what it is. Over Christmas, she and her Aunt Karen and Uncle Arlen measured the sunroom in a hilarious series of "Arlens". The sunroom is almost exactly four Arlens long. Isobel, it turns out, was two Arlens long. The couch was one Arlen, and five of pet cat Lucy. We've read Sir Circumference the first Round Table a number of times. Now she has a game she made up where she leaps towards her blow-up wading pool in what she calls the "diameter jump' -- I hold my breath every time as she leaps, finger tips to toes stretched out in one long line to touch the front and back of the pool at the same time, literally flying, flopping almost on the other side of the pool. She meets a four-year-old in the grocery store. She says, "You're four, I'm six. I'm two years older than you." Or, a three year old. "I'm twice your age." She has a pretty good experienced-based understanding about basic fractions, and has even been known to figure out something via multiplicative reasoning, but these episodes are fleeting, here and gone, hard to keep track of. She asks, "Who is older, you or Papa?" When I tell her Papa is 53 she is silent for a minute, looking at her fingers. Then she exclaims, "In five years he'll be a HUNDRED!" "No," I respond, "You're counting up by tens. You need to count by ones." We took a city bus not long ago. Got on a block from our house, followed the route south, then north again, to the center of town and out to the west side of town. It took a full two hours. Two thirds through our trip she asked for the route map in my lap and started tracing our route in real time. Every time we turned a corner or went around a curve, there her finger was, following right along. And, not that I'm at all surprised, she dances through the grocery store to the satellite radio oldies saying, "I use the square tiles to show me where to go, they help me make up my dance steps!" I swear to heaven above that I did nothing to overtly influence that observation. At some point I expect we will bring all this math down to the page. I almost said bring the math 'back to the page' but that's not what is happening. The math is in her head, thoughts and daily maneuverings first. You can't bring something back where it never was in the first place. There will be plenty of time for learning a formal notation system in the future, but it's still August and she's only six. It does strike me, though, that much of her mathematical thinking and reasoning right now seems to center around numbers, calculation and measurement. Ever since they started adding the dots on dominoes in Kindergarten this past winter she has really been taken by the process of adding together and taking away. I know math is not all about numbers but, no matter. These are the concerns of her mind, not mine. I do celebrate, however, that it is, apparently, very easy to find math all around us and I 'm excited to see what we find next! Although I do not have an "official" definition, I believe that a "living" math book is a book that presents mathematical concepts in real life context, which is relevant to the reader. A living math book is not a text book; rather it is a book...plain and simple...a book...with a storyline, which happens to have math skills integrated within the story. 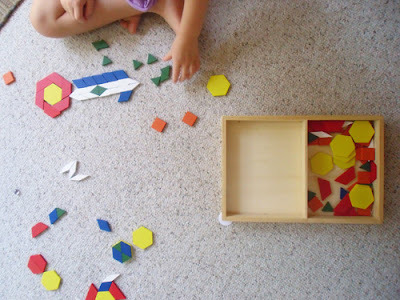 Such books can be used to teach and/or reinforce various mathematical skills and concepts. By this definition, many (though not all) of the books found on this list can be considered "living" math books. 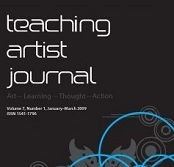 There are some very exciting things happening in the Teaching Artist world, the most recent of which is the newly launched Teaching Artist Journal ALT/space blog! Back in May I was asked to transition the print version of the ALT/space (formerly Newsbreak) section of the journal to an online space, and to curate and edit the new blog as well. After a few months of effort on the part of many, ALT/space is now a stand-alone entity from the TAJ peer-reviewed print journal and powered by Teaching Artist correspondents from around the country who are writing about their work and practice. Our goal is to paint a picture of TA life and work with the broadest possible representation of art forms, geographic locations, ages, and cultural perspectives. Tape! 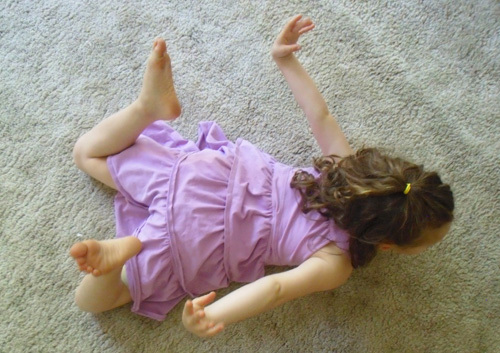 On the Floor! At MoMA! I know it's sorta' old news but I love this! I've been pretty public with my love for different ways to use tape to manipulate an environment and encourage physical exploration of that environment. Can you imagine what happens when a child enters this MoMA space? 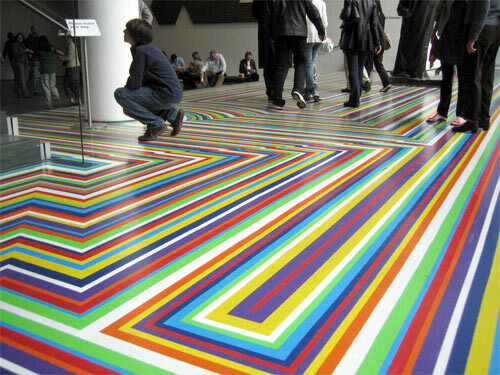 How do you use floor tape in your teaching? I bet the possibilities are endless. Send me some pictures so we can all see and I'll post them here!